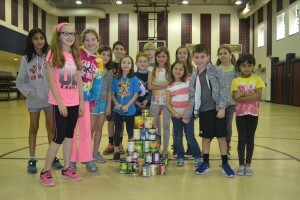 Haddonfield children recently tested their construction skills with cans, all for a good cause. 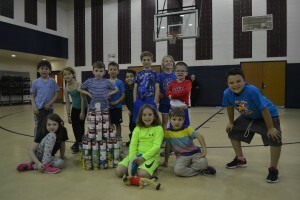 Haddonfield Child Care once again held its annual CANstruction event with the We CAN Help program, where students build structures out of cans and then donate those cans to a local food pantry. Children had a great time building the structures while learning about Science, Technology, Engineering and Mathematics and service along the way. “In our programs we try to do a variety of activities, we do everything from arts to science to service learning, and this kind of combines all of them,” Haddonfield Child Care Executive Director Denise Sellers said. “It was a lot of fun,” Ava Peifer, 10, of The LeBron Jamesers said. We CAN Help started two years ago at Elizabeth Haddon Elementary School. 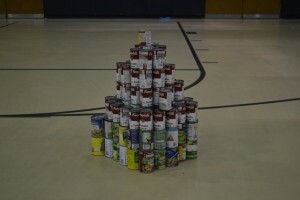 It is based on the CANstruction events that have become popular for architecture firms around Philadelphia and New York, in which architects and engineers compete in design with only canned foods. Due to the success of previous events, this year is the first year that all three elementary schools are participating in the program. The purpose of the We CAN Help program continues to be about incorporating STEM, the arts and service learning at Haddonfield Child Care. STEM is incorporated by the organizing, planning and building of the can structures; art is involved with designing the structure; and service learning is the cherry on top, donating the cans at the end of each event to a local food pantry. The Sun went to the Central Elementary School We CAN Help event, held on May 19 to watch the face off of the two teams, The Lebron Jamesers and Rock and Win. Students were told about We CAN Help a month beforehand, so they had time to think of a design and bring in cans. Most cans were brought in within the few days before the event, Sellers said. 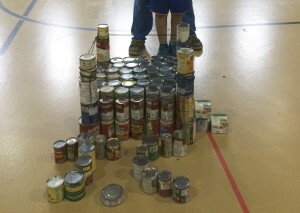 Each team had 30 minutes to build their CANstruction. They would be judged on structure, design and teamwork. Teams were also allowed to trade cans with the other team if a certain type of can was needed. The LeBron Jamesers originally had the idea of building a Rubik’s Cube, according to Diana Huebl, 8, however they did not have the sizes and colors needed. So they had to scrap that idea and together came up with the idea to create a pyramid with a grand entrance, adding gold cans to the top representative of the golden pyramids. Rock and Win originally wanted to create an emoji, but they thought it would be too hard, according to Michael Furia, 8, so they came up with the idea of the Empire State Building. Rock and Win started with the biggest cans at the bottom and then added the smaller red cans to the top, with the smallest one as the infamous point. Both teams found that the hardest part was making sure the cans didn’t fall. Both teams found their structures were slightly unstable. They learned that having the cans all right side up kept the cans from wobbling as much. “The cans were wobbly… so we had to switched the cans around,” Peifer said. Children found building the structures and trading cans are a lot of fun. “My favorite part was building with my team, having fun and doing my best,” Furia said. Judges for the competition were Mark Simmons, previously of Haddonfield Public Schools and currently of Free and Friendly Tours, Lydia Brown, former Haddonfield Child Care art teacher, and Deborah Mervine, chairman of the Haddon Fortnightly Evening Membership Department. The competition was very close, but The LeBron Jamesers were ultimately the winner for their pyramid. 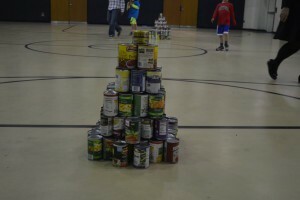 However, not all was lost for team Rock and Win because it collected the most cans with 140 out of a total of 236 cans. “Great job everyone,” the judges said. 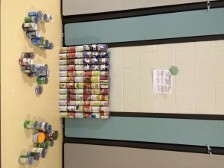 CANstructors won with their design of the flag of the United States, using the colors of the cans they had to create it, and the rest spelling out USA. The John Cenas were close, creating a wrestling ring in honor of their team name. However, the John Cenas collected a total of 127 cans compared to the CANstructors, earning them the win with number of cans. The total cans they collected were 230. All of the cans collected from this program are donated to the St. Paul’s Church Food Pantry, as Sellers is part of the Haddon Fortnightly women’s organization that often donates to it. According to Sellers, donating food items this time of year is very important as food items are depleted from the holidays and parents in need who rely on food for their children when away at school now have to provide that meal for them during the summer. “Pantries get a lot of food around Christmas and Thanksgiving, but then by the spring they are running low. Plus all of the kids are coming home for the summer and they are not getting their free lunches, so parents have to provide so many meals in the summer, it is really a burden for needy families. So that is why we try to make sure to collect as many cans as we can,” Sellers said. The Lizzie Haddon We CAN help event was held on Tuesday, May 24. The CANstructors and the CAN Franciscos both collected 336 cans. The winners were the CANstructors. They made a castle with multiple rooms and turrets. The CAN Franciscos made a rowboat.